This evergreen perennial subshrub has opposite, leathery dark green leaves and bears spikes of many small, pale lavendar, pink or white flowers in the summer. Height to 40 cm; spread 20 cm. 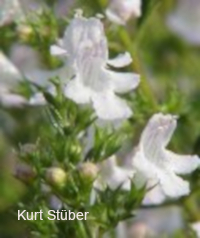 Grow in an herb garden as an edging plant; winter savory complements beans and meats and has various culinary and medicinal uses. For maximum freshness, please keep seed refrigerated in its original packaging until it is time to plant. Sow seed at 13-16 degrees Celsius in late winter or early spring. Grow on in moderately-fertile, well-drained, neutral to alkaline soil in full sun.